Baby Corn: I've used a small can containing about 10-12 pieces. I used this because I had it in my pantry. Otherwise, you can use the raw baby corn you get in the vegetable section. You could also use big corns instead. Cut them into desirable length and Boil them in water along with little salt and keep aside. Heat oil in pan and fry onions till golden brown. Add ginger paste and fry for another minute. Add the tomato puree and other masala’s. Add the pre-boiled baby corn into the masala and let cook in medium heat for about 10 minutes. Add water to attain desired consistency. The corn should soak in all the masala’s. That’s when you know it’s done. This gravy serves 4 people and goes well with rice, chapatti or roti’s. Hi, Wow! it looks so tempting, got to try! 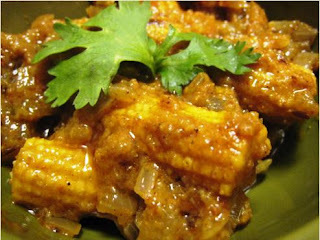 Baby corn masala looks yum,now I will go an check your other recipes.I have two blogs you can check out! Thankyou Asha and taste of Mysore.